Making many different kinds of cookies is a reflection of Christmas that always shows itself to me right about now. Over time I have experimented and have emerged with an international repertoire to choose from each year. The sources are varied. When I make any particular cookie more than one year in a row, it gets added to the repertoire. If made four or five years in a row, they become part of a treasured archive, as cookies cherished and coveted and looked forward to each year by family and friends. The three that have withstood the test of time and are asked for each year are my grandmother’s almond crescent kurebies, Italian chocolate mostaccioli, and the raspberry filled Swedish tarts. Other years my Christmas tins have been filled with our family traditional cutout sugar cookie from my mother’s recipe, gingerbread men, German honey cakes, and Mocha-Almond Biscotti*** from a recipe found in ‘Eating Well’ magazine twenty-five years ago. I can’t remember the last time I made the biscotti. They aren’t really all that special. They aren’t the rich buttery confections typically associated with the holidays. They are just simple crunchy sweet toast like cookies with mere hints of the flavors found so intensely in the other cookies. The recipe is from a magazine dedicated to cutting fat, making food lighter and more nutritious. 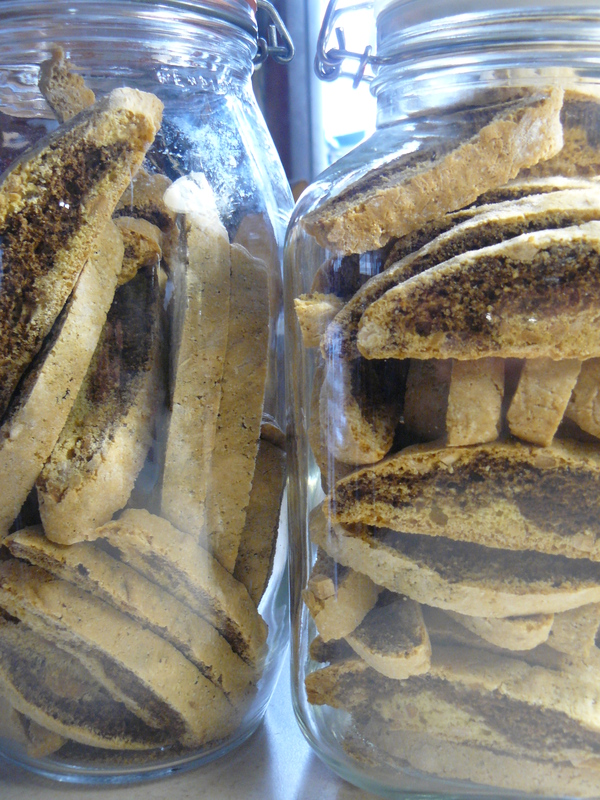 These biscotti aren’t what you would expect, as cake like versions found in the bakeries. But there is something appealing about the crispness of these cookies, a light quality that offsets and balances the richness found in all the others. So I made them for years. Filled glass jars with them to give as gifts. Loved the process of making the marbled logs that would get sliced and baked again. And then just stopped for some reason. I don’t know why they fell out of the treasured archive. Something has triggered my desire to add these to the mix again this year. I spent days ignoring the image that kept popping up and insisting to be seen. 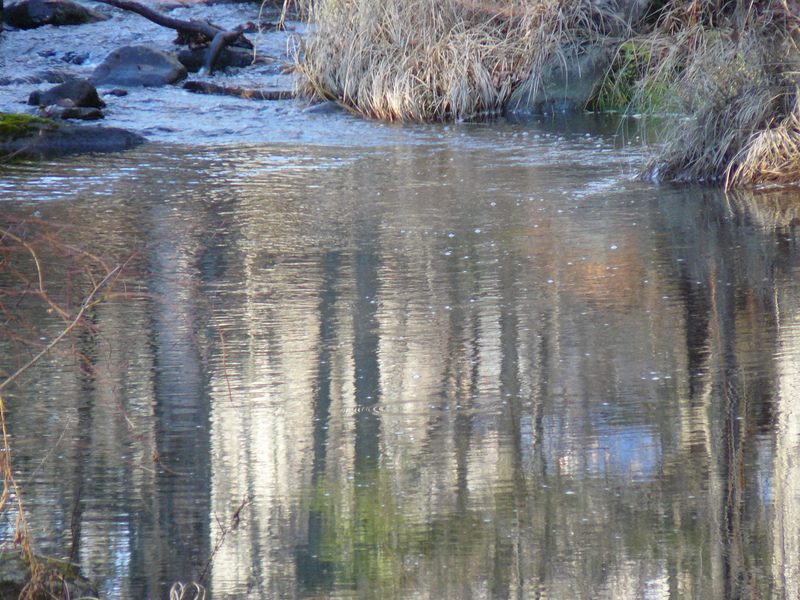 Like the reflections in the water at the edge of my property where the brook begins. 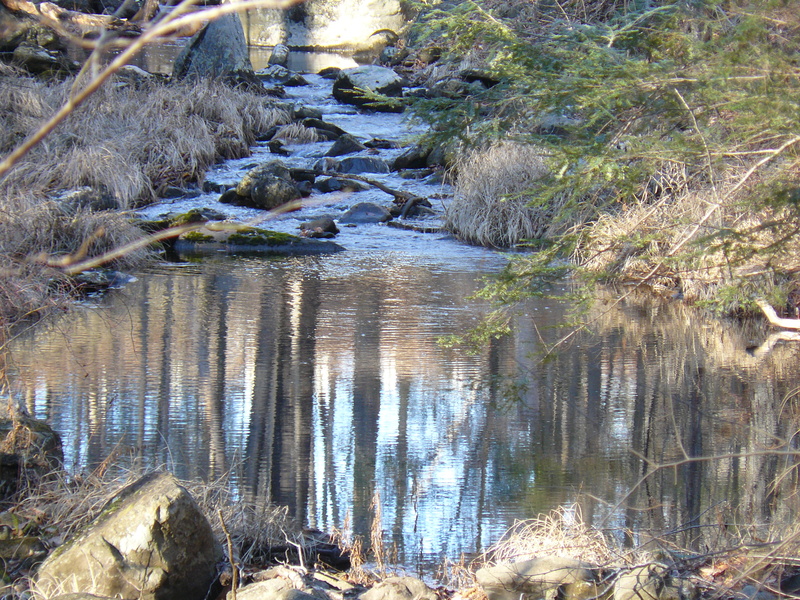 It is a large pond like body and depending on the time of day, offer gorgeous reflections to be seen. Every day for this past week I have stopped to gaze at the reflections there, wondering why. I’ve been trained to see reflections. To see the image on the surface, the emotion on a face, the lesson that appears in the wake of disappointment or suffering. They are all things that show themselves to be seen. Then what? It’s like seeing anything arresting, the impulse to preserve the image, to remember it somehow, kicks in. As a professional creative, an architect trained to reflect my client’s wishes in the design of a building, as a fabric artist with my own wishes to express, or as a chef in my own kitchen of daily wonder, my work depends on this tool of reflection. So I made the biscotti. Dug up the stained page where the recipe lives, made a few mental substitutions, decided to double the recipe, laid everything out on the counter. It all sat there for a day, a presence and a reminder, before I finally made the commitment. Not sure why it felt like a commitment, but it did. I was digging up something from the past based on a feeling or an image that triggered a feeling. It was just a feeling. A good feeling. I really didn’t need to analyze this or bring the meaning of the reflection to some conscious place. I just went with it. I loved the process all over again, let myself enjoy the memory right along with the present experience. I realized how much I have been working on letting memories be what they are, maybe even let them have a voice, let them go, and then just come back to where I am. I loved the feel of the moist marbeled dough and the pleasant memories evoked by the aroma of chocolate and almond together. I loved the feeling of Christmas that surfaced with it all. 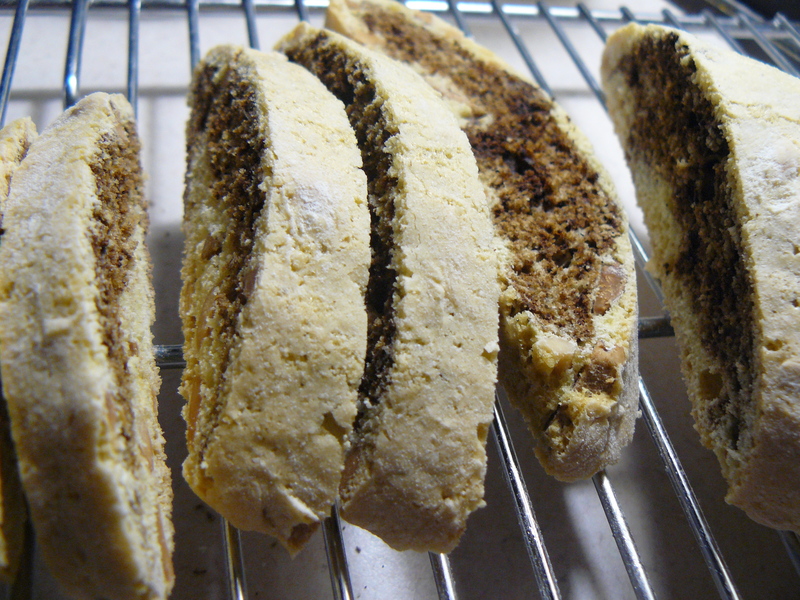 The biscotti looked perfect when done. It was a pleasure to see the two large jars filled with these slices. They came out so much crunchier, much ‘harder’ than I remember. I resisted the idea that maybe these cookies needed to be removed from the archive for good, that they really don’t belong in the Christmas repertoire. I didn’t want to be wrong. I ate a dozen of them, crunching my way through the sweet dryness until I thought to dunk one in my tea. And there it was! The way to eat these cookies! They are the perfect dunking cookie, a perfect palate for absorbing the warmth and flow of something liquid and ever changing, and solid enough to hold it together long enough to be fully experienced. Smile smile. Preheat oven to 325 degrees. Spread almonds on baking sheet and bake until lightly toasted, about 12 minutes. Set aside. Whisk together flour, sugar, baking soda, baking powder, and salt. In another bowl, whisk together eggs and vanilla, add to dry ingredients and mix until just smooth. In a small bowl, mix cocoa, coffee and 4 tsp. water. Divide dough in half. and almond and almond extract to one half, melted chocolate and coffee mixture to the other. Mix each until just incorporated. Place half the almond dough on a well floured surface. Dough will be moist so don’t be shy with the flour. Pat into a 4″ x 8″ rectangle. Top with half the chocolate dough. Roll up lengthwise into a cylinder and roll cylinder back and forth gently to form a 14 inch log, 1-1/2 inches thick. Repeat with remaining dough. Place logs on parchment covered baking sheet. Bake for 20-25 minutes until firm to touch. Transfer to rack to cool. Reduce oven to 300 degrees. Cut logs diagonally into 1/2″ slices. Stand slices upright on pan with space between each and bake for 40 minutes. Let cool before storing in airtight container. Will stay fresh for up to one month. I can just see you making the tea discovery, smile. Another comfort-post.